Looking back on an exhilarating 2010, I wanted to take a second to just say thank you. No frills, no flourishes. Just thanks. There’s a LOT of places you could go to get you social media and digital marketing fix, and I’m incredibly honored that you choose to spend time here. As part of my look back at the ~150 posts that appeared here this year, I sifted the top 10 that received the most page views. To me, it’s an interesting combination of tools recommendations and bigger picture trend coverage – just what I’m shooting for here. Hopefully, some of your favorites made the list, and perhaps there’s some others that you missed. Second most popular post I ever wrote. Makes me realize how much noise there is in the social tools space, and how much people crave clarity and recommendations. One of the more controversial posts, and a place where I sounded the alarm initially about Facebook’s master plan. I’m not sure I agree with all of this now, but it’s an interesting read. I originally wrote this for Social Media Examiner and it did well there, too. Shows how much people want to know about the mechanics of Facebook fan page operations. The fascination with Twitter has no limit. This was one of my favorites this year, as it was one of the first times I analyzed and interpreted research findings. I’m doing more of that now, and I like it. This one was from the heart. Since I work with a lot of agencies all over the world, the content in this post was very personal and visceral. I’m delighted that it got a lot of attention, as it’s an important issue if we’re going to truly move this industry forward. A terrific, relevant guest post from my friend Katie Van Domelan (now the client services manager at Cotweet – one of my clients). She nailed it. Another one that appeared first on Social Media Examiner. I channeled my inner Mari Smith this time and took the pro-Facebook position. This is one that’s very useful (I think) for event folks. 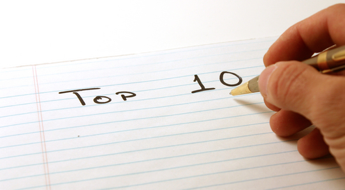 I’m glad that one of my posts where I include slide presentations made this top 10 list. This one was a redux of #1 (the 39 tools). Amazing that both made it. This is the newest post to make the top 10, written just a few weeks ago. Lightning in a bottle. I wrote this in 25 minutes on the plane on the way back from Austin. It’s one of the five or so posts I’m most proud of this year. Even Robert Scoble tweeted that he thought I nailed the SXSW experience. That was pretty cool. I guess it’s not a surprise, but nine out of the top ten have numbers in the title, which matches up with my analysis of winning blog post headlines. I don’t love the fact that numbers do so well because it can become hackneyed, but the data doesn’t lie.